Waiting Room: When it's open, Julia's Kitchen never looks like this. There are two questions you immediately want to ask pastry chef Nicole Plue. The first is whether her former boss, Martha Stewart, is as notoriously difficult as the mini-dramas, tell-all writers and tabloids would have us believe. The second is, can I lick the beaters? No, really. Can I? Dressed in her chef's whites and clogs, Plue fortunately has a good sense of humor for people with sticky fingers. Winner of Bon Appetit's Best Dessert, New York award, she's been a pastry chef for 14 years, after all, and most days you'll find her at Pinot Blanc restaurant or at the far end of Julia's Kitchen in Napa's COPIA complex whisking and stirring some combination of butter, sugar or cream into artfully plated desserts you can't help but want to pilfer. One of the most celebrated pastry chefs in the state, Plue is different. She is obsessed not with chocolate or elaborate towers of spun sugar, but with more local ingredients: stone fruit, rhubarb and just about anything else growing in the gardens and orchards of COPIA. Eschewing fussy, pretentious desserts, Plue is more comfortable creating funky, updated versions of old standbys like rhubarb crisp, peanut butter cookies, herb-infused pot de crème and apple tarts inspired by Julia Child. She will never create some sort of chocolate-upon-chocolate blowout for the menu. "I've just never found that sort of thing interesting," she shrugs, though chocoholics should fear not: there's always something wickedly chocolate to eat on Nicole Plue's menu. Walking through COPIA's industrial-sized kitchens, I get a disappointing answer to a question before I've even mustered the nerve to ask it. The large mixers filled with sugar and cream turn out to be bath-sized rather than licking-sized. Not necessarily a bad thing, but I've just met Plue and getting naked in her mixing bowls seems just a little forward. Not to mention those pesky health codes, damn them. Which brings us to another somewhat awkward situation: Plue works in an open kitchen just feet away from diners. Though she can pull off a chef's swagger, Plue is not exactly comfortable putting on Emeril Live for diners every night, let alone enduring that horrid moment should someone dislike her food. "Sometimes I just can't look up," she says. Though reviews are more glowing than otherwise, someone's always a critic, and folks tend to feel especially entitled when they come to a restaurant named for Julia Child, the grande dame of French cooking. Just Desserts: Napa pastry chef Nicole Plue is a sweets sensation. Plue, however, takes it all in stride. "I don't let good or bad reviews change what I do," she says, plating up a selection of desserts. Everything, she says, has been done and done again, which Plue feels frees her up to not worry that much over whether she's being original. She's more concerned about things tasting good. "You want to taste, right?" she asks, pulling things from trays and the tiny refrigerator in her station. Do I want to taste? Hmm. Let me ponder that one as I rip the plate from your hands and knock you over to get a spoon. Got any milk to go with this? The dessert grouping, however, is an odd mix. A tiny peanut butter cookie inspired by La Brea bakery founder Nancy Silverton, a sage-infused chocolate pot de crème, a grapefruit flavored marshmallow and one of her signature dishes crunchy dessert called peanut gianduja. Don't ask me to say it. I can't. Chocolate is usually a delightfully supporting cast member, rarely taking the lead role in Plue's desserts. And though it would be a career-ending statement for other pastry chefs, Plue says she's not the biggest fan of chocolate on its own. Not that she doesn't understand that other folks live, love and die for it. It's just never been that interesting to her, maybe because when she was learning to cook in her mom's kitchen, chocolate wasn't easily available. Instead, her parents were health nuts who always had lots of fruit and nuts in the cupboard. "I'm totally influenced by the garden," she says, pointing outside to COPIA's fledgling herb and fruit gardens. "I do this flight of pots de crème with lavender, bay leaf and lemon verbena." Bay leaf? Ick. However, the pot de crème, which is a sort of thick, rich pudding, matches perfectly with the anise-y, bold taste of the bay leaf. It's odd, but totally right. Acclaimed by California Homes as one of the top six best pastry chefs in California and having been Stewart's personal pastry chef for several years, Plue, thirtyish, is practically wizened in the world of pastry chefs, who often bail for greener pastures in bakeries (or home life) after a few years of 18-hour days. So what's an English major doing in chef's whites? Like most cooks, Plue says she was always hanging out in the kitchen as a kid, making lumpy cakes and inedible desserts early on and working up to more elaborate meals. After a detour into the nonprofit sector, she ended up in cooking school. She decided on the pastry-chef route only after seeing a fellow pastry chef sitting at the bar, drinking wine at 4pm as the dinner chefs were racing to get ready for the crowd. That life, she said, was for her. Thinking back, she says, she's never sat at a bar at 4pm. She's always been too busy. Which brings us to Martha. 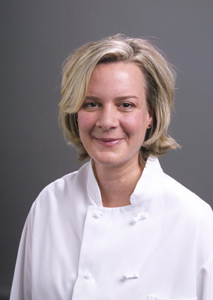 How does a girl end up as the personal pastry chef for Martha Stewart? Turns out it's who you know--or, rather, who you work for. Plue was employed at a swanky New York eatery Stewart frequented with her celeb pals. After taping two baking segments on the show, Stewart asked Plue to come north and work in her kitchens permanently. There was no real job description, no real expectations other than being on set during all of the baking segments and knowing precisely how thick to roll dough. Plue grew bored, and eventually left to find new opportunities. Not, she notes, due to any disagreement with Stewart, whom she found to be a very "hardworking and confident" woman. But, yes, Martha could have moments of, well, intensity. Like, say, asking her own mother to breathe a little less loudly during the taping of a Christmas special. Hey, nose whistling can be a real annoyance, especially during the holidays. Sheesh. Someone needs to chill out and get naked in a vat of chocolate frosting. Plue says the most romantic thing about dessert isn't chocolate; it's sharing a warm dessert. "I love things you have to eat together," she says. Fondue is a special favorite, Plue loving how couples have to talk over the pot together. She plans a special Valentine's menu that will feature two-part desserts for diners. Each person gets one part of the dessert and has to share it with the other. Delicious! Julia's Kitchen offers a special prix fixe Valentine's dinner on Monday, Feb. 14, from 5:30pm to 9:30pm. While lobster, crab, ahi and beef illuminate the main menu, Plue offers a selection of rhubarb crêpes suzette with iced rhubarb parfait, dark chocolate millefeuille with café brûlot ice cream and bay fudge sauce, vanilla bean coeur à la crème with a trio of sorbets or artisinal cheeses for a velvet finish. 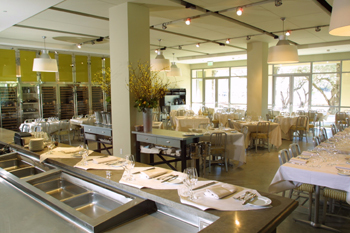 At COPIA, 500 First St., Napa. $75 per person. 707.265.5700. From the February 9-15, 2005 issue of the North Bay Bohemian.